A landscape is always a mix-and-match of various features and elements. These features add beauty and functionality to your immediate surroundings and increase the value of your home. Aside from this, when you have well-appointed yard spaces, you are more inclined to use them and this provides you return on your investment. We at Mother Nature Landscaping are a full service company that has handled a number of small and large scale landscape design projects for customers in and around Bloomington, Martinsville, Mooresville, Bedford and Columbus. Over the years we have also catered to customers across Franklin, Seymour, Greencastle, Greenwood, Plainfield as well as Beech Grove. With 15 years of experience behind us, we are the experts that focus on providing customized solutions to our clients. Many clients also want decking installed on their properties. In some cases these features may be built as part of a complete landscape design project. However we can also install these for you as standalone features when you undertake a landscape upgrade on your property. Regardless of what your requirement is, we work very closely with you and focus on creating custom deck design that complements the appearance of the rest of your landscaping. 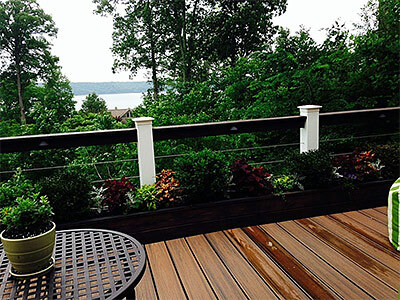 Type of decking material such as timber, aluminum, composite etc. No matter which way you look at, opting for custom deck plans is one of the best ways to ensure that you get an alfresco area that’s perfect to spend leisurely moments and entertain in. If you looking for experienced and reliable deck designers, you need look no further than our company. You can discuss your project details with the specialists at Mother Nature Landscaping and we will provide solutions at very reasonable landscape design cost. The number to call is - 812-339-5296. You can also contact us via this online form or request for a free consultation and quote via this form.